In the ’90s, ‘got milk?’ ads and milk mustaches bombarded our TV screens, telling us that we NEED dairy to ‘grow up big and strong.’ (And, that milk would make us look good, weigh less, and become a celebrity/pro athlete…) But, plenty of people nowadays talk about dairy like it’s poison. “Dairy is inflammatory, it causes cancer, humans aren’t meant to drink it!” Now, none of these claims are ‘proven’ with concrete evidence. But, there’s some truth to each of them. So, IS dairy bad for you or not?? Not necessarily, but maybe. First of all, no single food is the sole cause of chronic inflammation or chronic diseases. The combination of foods we eat regularly can boost our health, or fuel the progression of chronic conditions. And, there’s science on BOTH sides of the issue—some evidence for dairy’s benefits, some for its potential dangers. The truth is, dairy affects each of us differently. Our bodies, diets, and lifestyles are all so different. And, when it comes to dairy, our genetics actually play a major role in whether or not we can tolerate it. But, research shows that a LARGE majority of people have issues digesting dairy. Often, those issues seem pretty minor, like bloating and indigestion. But, those symptoms may indicate that you’re sensitive to or intolerant of dairy. And, if those ‘minor’ symptoms go unchecked, we can put a serious strain on our body, gut, and immune system. (Plus, the oh-so-controversial dairy products are more likely to pose problems for people with digestive troubles or autoimmune diseases.) While dairy might cause no problems for some people, the question remains: is dairy bad for you? Certain dairy products actually contain loads of nutrients, vitamins, and the infamous calcium. 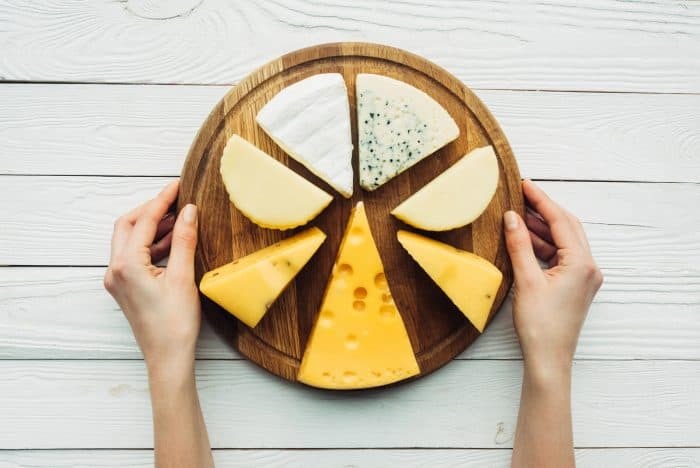 (But, since we can’t absorb very much of the calcium in dairy, studies show that it doesn’t actually make our bones stronger…) And, more research studies than not find that dairy doesn’t cause inflammation, and it may even protect against some chronic diseases. There’s even research that associates full-fat (grass-fed) dairy with less belly fat, lower triglyceride levels, and a 62% lower risk of type 2 diabetes! So, Why Are So Many People Going Dairy-Free? So, the logic here is that humans are the only species that consume milk in adulthood. And, it’s milk from another animal, no less. Before we started farming and domesticating animals, most humans only drank milk as infants—from their mothers. But, people in some areas of the world have been eating dairy for centuries. So, again, whether we’re ‘meant’ to consume dairy products or not, who can really say? However, this bit of history is relevant and explains a lot of the controversy surrounding dairy. Dairy products contain a naturally-occurring sugar, lactose, which the body has to break down in digestion. But, it’s estimated that nearly 3 in every 4 people lack the digestive enzyme we need: lactase. 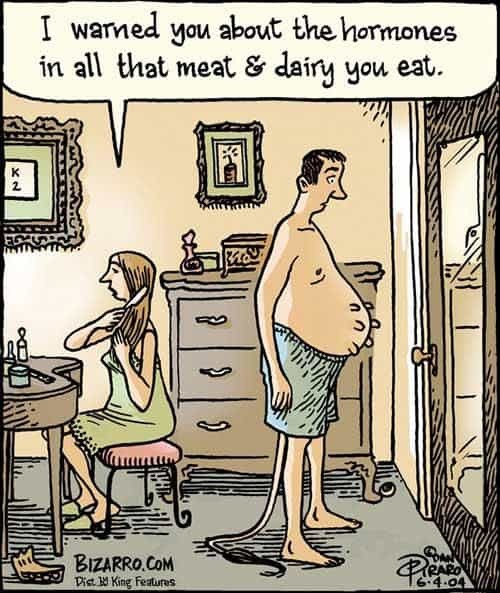 This is what we call “lactose-intolerant.” And, the remaining few who can tolerate dairy should thank their cow-raising ancestors for the stroke of genetic luck. 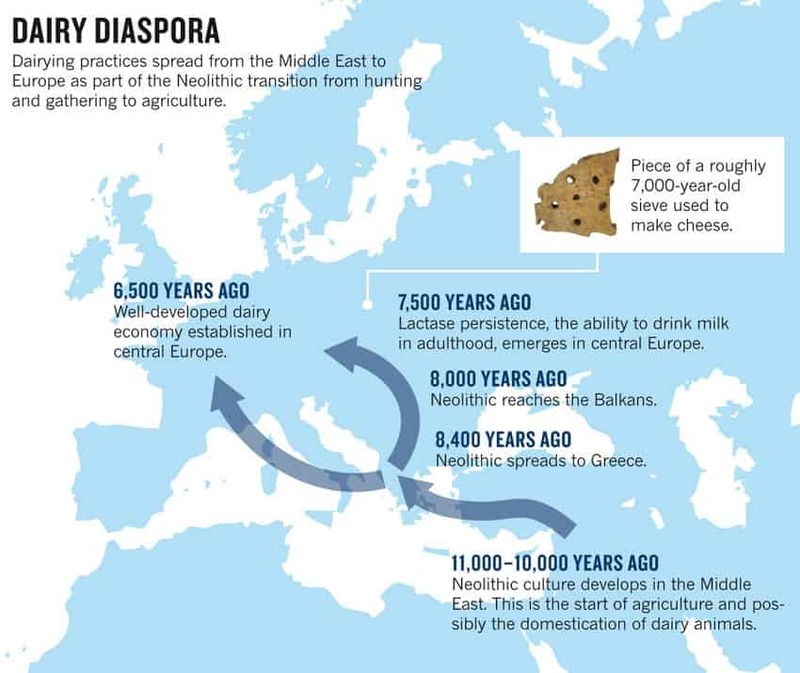 In those areas where people did eat dairy centuries ago, their genes adapted to tolerate lactose. 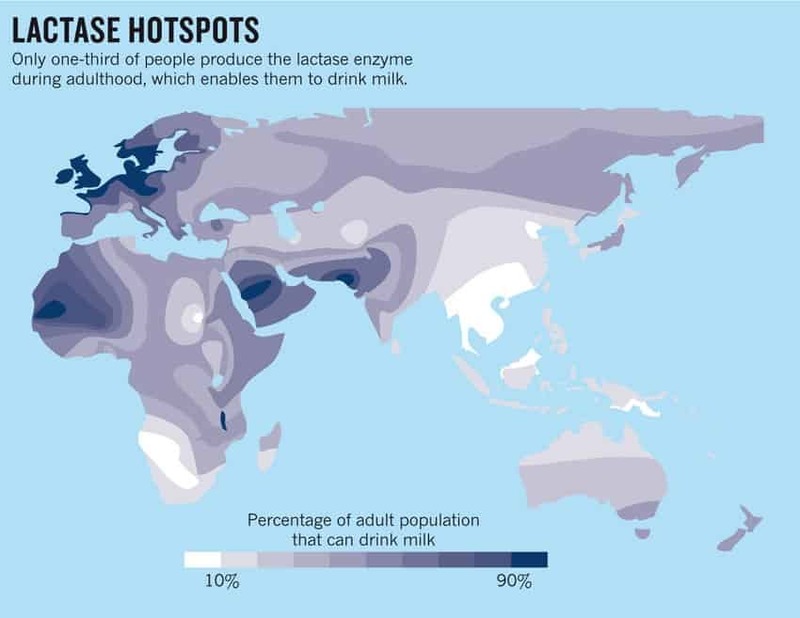 So, people today who produce lactase likely can trace their family lineage back to those early dairy-loving areas. As kiddos, we’re all born with lactase because we need it to digest our mother’s milk. But, by the time we’re two years old, MOST of us start gradually producing less and less lactase. Sooner or later, we stop producing it altogether. Without lactase, the undigested lactose sugars from dairy will ferment in the colon, causing all sorts of icky digestive symptoms. Depending on how severely intolerant you are, that can range from bloating to gas to diarrhea, and everywhere in between. Granted, even the lactose-intolerant can tolerate certain dairy products more then others. Butter is the fat separated from the milk, so it’s low in lactose. And, fermented dairy products contain bacteria that can help digest some of the lactose for us. But, if you’re not one of the rarities who can properly digest dairy, eating it may contribute to or worsen other health problems. Think about it: if your body physically isn’t capable of digesting lactose, how will it react when lactose comes around? Because SO many people can’t digest lactose, there’s plenty of potential for dairy products to cause problems. Plus, there are a few other concerns worth noting. Plus, that undigested lactose will cause digestive strain and may weaken the gut lining. This could lead to or worsen leaky gut. Much like the difference between conventionally-raised and grass-fed meats, the quality of nutrients in dairy products depends on how the cows are raised. Dairy from cows that eat a natural diet (grass-fed) contains more healthy omega-3s and vitamins, like K2. But, these wholesome nutrients are only present in grass-fed, full-fat dairy. Even full-fat dairy products from conventionally-raised (grain-fed) cows are lower in these nutrients. The breed of cows producing the dairy you consume also can be problematic for some people. Historically, older cow breeds have naturally produced A2 milk proteins (a.k.a., A2 beta-casein). And, fewer people have problems digesting these natural proteins. 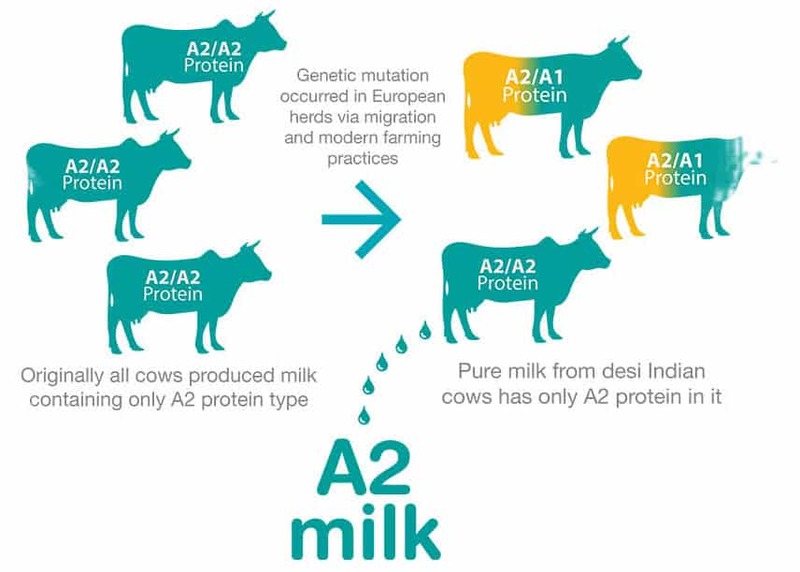 But, thanks to migration and modern farming practices, European herds experienced a genetic mutation Now, most newer and modern cow breeds produce dairy with A2 AND ‘A1’ proteins (A1 beta-casein). And, some people have trouble digesting these new A1 proteins, or are even allergic to them. 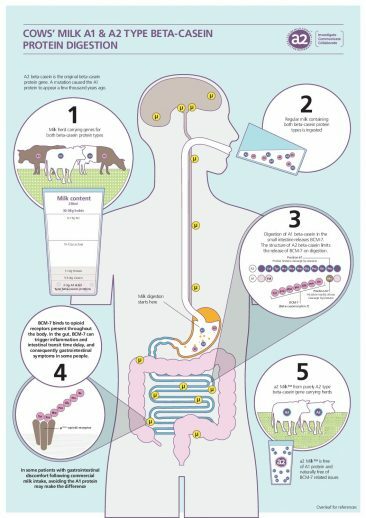 These A1 proteins are an unnatural mutation of A2 proteins that can make animals and humans sick. In the gut, A1 beta-casein can trigger inflammation and slow down digestion, leading to stomach problems for many people. On the other hand, A2 beta-casein helps to limit inflammation and is much easier to digest. And, researchers looking at consumption of A1 dairy found a correlation with heart disease, type 1 diabetes, autoimmune diseases, and some cognitive disorders. Unfortunately, these A2 dairy products can be difficult to find nowadays. Like in the graphic above, there are some special dairy farms that dedicate themselves to producing A2 milk. But, the MOST common breed of dairy cows today (Holstein) produce A2 and A1 proteins. So, the majority of dairy products in grocery stores also contain A1 beta-casein. Overall, current scientific research suggests that dairy isn’t inflammatory. But, dairy still can be inflammatory for some people. And, a few studies out there found that both full-fat and low-fat dairy increased markers of inflammation in the body. And, dairy from conventionally-raised cows can be more inflammatory than grass-fed. Because of their unnatural diet, grain-fed cows produce dairy more pro-inflammatory omega-6s and fewer omega-3s. Also, remember that most adults lack the enzyme needed to digest dairy. So, the body may mistake lactose as a ‘foreign invader’ and respond with inflammation. Then, these hormones end up in the dairy we And dietary hormones can then throw off the natural hormone balance in our bodies. Plus, the majority of non-organic dairy farms in the U.S. also inject their cows with synthetic growth hormones to increase milk production. Now, relative to 50 years ago, cows produce nearly twice as much milk (19,000 lbs) per year. In 1993, the FDA approved the growth hormone rBGH (recombinant bovine growth hormone), also known as rBST (recombinant bovine somatotropin). But, other countries like Canada and the European Union do NOT permit the use of rBGH and rBST. Both cows and humans produce natural growth hormones. In cows, it’s BST (bovine somatotropin), and the human form is known as somatotropin. These hormones increase levels of insulin-like growth factor (IGF-1), which helps stimulate cell growth. This is what increases cows’ milk production. 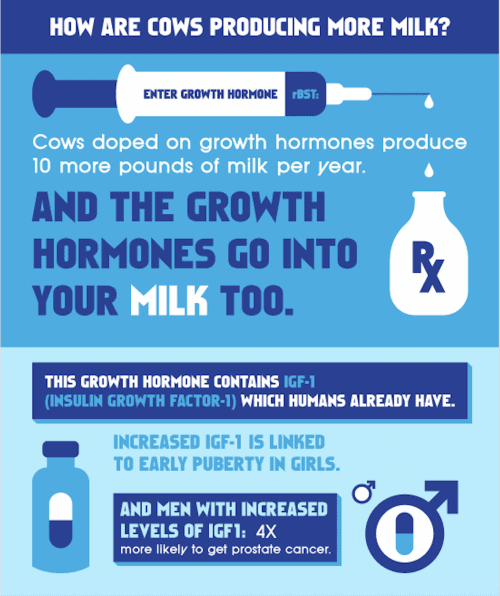 But, synthetic growth hormones(rBST/rBGH) cause cows to produce much more IGF-1 than they would naturally. This is what increases milk production, and often leads to dairy cows suffering from health problems and living shorter lives. Plus, that IGF-1 then ends up in our dairy products. 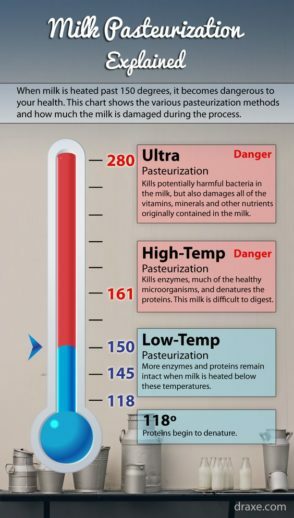 Lastly, most dairy today is pasteurized in order to kill potentially harmful bacteria. But, to do this, the milk is heated to very high temperatures (the standard is ‘high heat pasteurization’ at 161°F). And, this high heat then damages the nutrients and makes others harder to absorb. In particular, the heat alters the structure of the proteins in milk, which can cause digestive issues in some people. And, some studies found associations between consuming pasteurized dairy and the development of certain autoimmune diseases. Basically, pasteurization is a form of food processing. And most conventional dairy products in grocery stores today have gone through LOTS of processing! (Even though dairy seems like a ‘natural,’ ‘whole food.’) Just like with other ultra-processed foods, dairy products have been significantly altered from their whole foods form. So, they affect our bodies in a way that can be damaging. If you’re in the dairy-tolerating minority, dairy may not cause any problems for you! But, if you do choose to consume dairy, be sure to make high-quality choices. The ideal dairy products would be raw (unpasteurized), organic, grass-fed, and full-fat. But, unpasteurized dairy can be pretty hard to find and comes with some risks. Organic and grass-fed dairy products can also be tough to find and usually cost more. Or, some fermented dairy products, like yogurt and kefir, can also be good choices because of their probiotic bacteria. But, even for those who can digest lactose, dairy may still be problematic. Most dairy we find in the grocery store isn’t of the highest (or healthiest) quality. More often than not, it’s hard to find grass-fed, let alone dairy from A2 cows. Then, you have to consider the dietary hormones, as well as the heat-damaged nutrients in pasteurized dairy. Also worth noting: most dairy products are excluded from elimination diets, like Whole30 or the Low-FODMAP diet. So, for anyone with IBS or other gut troubles, you and dairy may not get along. Clearly, there are A LOT of variables! And, as with gluten and grains, different dairy products can affect your body differently than someone else’s. Again, trust your gut—literally… Do you feel bloated and gassy after eating cheese or downing a glass of milk? Or, do you just suspect that your body doesn’t handle dairy well? If so, cut out dairy products for awhile and see if anything changes in your body. This is the best way to find out if you’re sensitive to (or intolerant of) dairy products. And, you can always try adding dairy back to your diet to see how your body handles it. So Do I Have to Give Up Cheese?! Maybe, but maybe not! Remember, your answer to the, “Is dairy bad for you?” question may be different than it is for someone else. You could be in the lactose-tolerant minority, so dairy might not be problematic for your body. But, you may still want to consider other issues with dairy, like pasteurization, proteins, and hormones. Or, if your body doesn’t tolerate dairy well, yes—you might want to give up cheese. Is dairy bad for you, even if it isn’t ‘bad’ for everyone? Ultimately, you will have to actively pay attention to your body after you eat dairy to get a sense of how sensitive you are to it. And, I highly recommend trying an elimination diet (like Whole30) so you can accurately pinpoint the source of your symptoms. 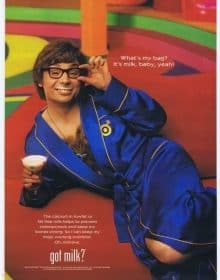 Above all, I encourage you to look at dairy separate from the health promises of ‘Got Milk?’ campaigns. There are some problems with dairy that are worth your consideration. So, get out there and do your own research! As always, the more information we can learn, the more power we gain to transform our health for the better. Want to learn more about making healthy choices at the grocery store? Check out our FREE Healthy Staples Course! Sign up for free to learn about how to choose healthy bread, cooking oils, dairy products, & more! Are Grains Bad For You? Is Gluten Healthy? & What About Legumes? We hear about the health benefits of fiber-filled whole grains and protein-packed beans all of the time. But, how do they affect your body? 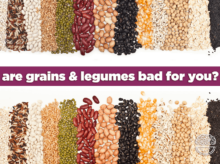 Learn about the potential benefits and problems with grains, gluten, and legumes! What Is Whole30? + Whole30 Recipes! 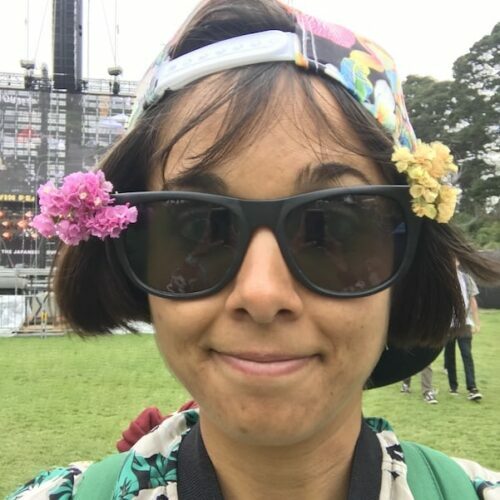 Passionate wordsmith and weirdo, hungry for adventures.